This daisy-like plant was named by Harvard botanist Asa Gray. Gray classified this species from a sample sent to him from Alaska by John Muir. Muir discovered the plant near Cape Thompson in northwestern Alaska. Habitat: Dry, south-facing fellfields, bluffs, terraces, alluvial fans, gravels and sandstone outcrops. Usually in sparsely vegetated communities. Dawe, J.C., and D.F. Murray. 1981. Chromosome numbers of selected Alaskan vascular plants. Canad. J. Bot. 59(8):1373-1381. Hulten, E. 1941-1950. Flora of Alaska and Yukon. 1-10. Lunds Univ. Arsskr. N.F. Avd. 2, Vol. 37-46. 1,902 p.
Hulten, E. 1967. Comments on the flora of Alaska. Arkiv Bot. 2(7):1-47. Almqvist and Wiksell, Stockholm, Sweden. Hulten, E. 1968. Flora of Alaska and neighboring territories. Stanford Univ. Press, Stanford, CA. 1,008 p.
Murray, D.F. 1980. Threatened and endangered plants of Alaska. U.S. Forest Service and Bureau of Land Management. 59 p.
Murray, D.F. and R. Lipkin. 1987. 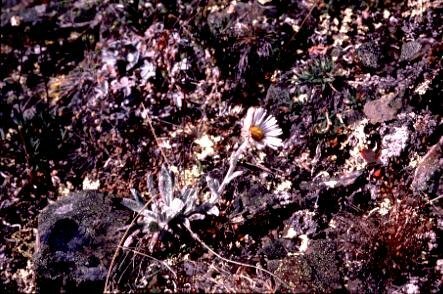 Candidate threatened and endangered plants of Alaska with comments on other rare plants. Univ. of Alaska Museum, Fairbanks, AK. 76 p.
Walker, D.A., P.J. Webber, N.D. Lederer, and M.D. Walker. 1987. Terrain and vegetation of the Department of Energy R4D research site, Imnavait Creek, AK. I. Classification and mapping. Unpubl. rep. Univ. of Colorado, Institute of Arctic and Alpine Research, Plant Ecology Laboratory, Boulder, CO. 68 p.
Walker, D.A., E. Binnian, B.M. Evans, N.D. Lederer, E. Nordstrand, and P.J. Webber. 1989. Terrain, vegetation and landscape evolution of the R4D research site, Brooks Range, Alaska. Holarct. Ecology 12(3):238-261. Wiggins, I.L., and J.H. Thomas. 1962. A flora of the Alaskan Arctic Slope. Arctic Inst. Special Publ. 4. Univ. of Toronto Press, Toronto, Ontario, Canada. 425 p.